Some of you are getting stuck on definitions. Both are technically manufactured homes. The top one, as mentioned, is built in modules in a climate controlled factory, trucked to the site and the modules assembled on a foundation. They typically increase in value with the area. The second one is what some of you think the top one is. They are typically (but not always) located in dvelopments where the placement lot is rented. They typically depreciate. In many areas of the US the second one is affordable housing. CSD610, you are confusing some terms. Mobile home = manufactured home. The term used changed at some point a few decades ago. What you are discussing is called MODULAR. A modular home has sections build in a factory then joined and set upon a foundation that is poured at the home site. Modulars are usually less expensive to build than stick built, but use the same materials and finishes. Here in NC, a manufactured/mobile home can be 'converted' to a different tax classification if they are wheeled to personal piece of land then the axels are removed and a foundation installed after the fact. Someone who has one can provided more info, but in NC rural areas you often see these on an acre or two of land. I think this allows one to obtain a conventional mortgage. I have never owned a manufactured home but see that they can be a reasonable alternative for someone on a tight budget. To make the definition even easier...what I think many are attempting to describe is a prefab - prefabricated - home. 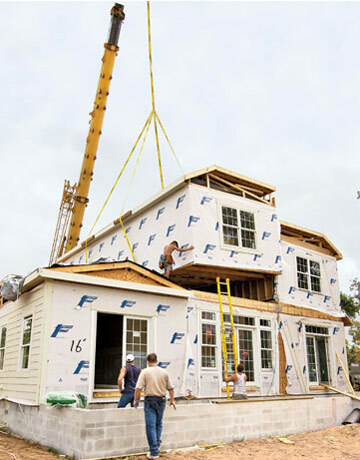 A truck brings in sides, interior walls, trusses, joists, drywall, plywood sheeting, shingles, windows, doors and siding to finish it all - like a house in a box kit. It's all put together in an indoor factory and the pieces fit good if weather is cooperative. It's cheaper than an entire crew of carpenters and laborers on site. You do need an electrician and plumber as well as an HVAC guy. Modular is the closest I have seen here to describe it though modular homes are typically two halves trailered in and assembly completed when on site. Not much to them but they are livable. They are different than a mobile home as found in trailer parks as they cannot be towed away by simply putting the wheels on and hooking it up to a truck. A mobile home - trailer - sits on a trailer frame whereas a modular home does not. I remember when roof trusses and floor joists were prefabricated and trucked out to construction sites. We thought they were trying to do away with us as they were typically hand made on site. Then came prefab walls and other stuff. My friend's mom has a manufactured home and she had to occasionally do some repair on it. Time after time she found that they had made so many short cuts or done something cheaply that it was very difficult to fix. For instance, they would cut pipes short so they didn't provide proper venting. And don't they call them "tornado magnets" or something as they just go to pieces in a storm? I have to apologize for the non-PC and antiquated term I used a couple posts ago. Affordable housing is now called workforce housing. There was a townhouse development put in near me in the late 1990s using modules. Buy-in at that time ranged from $350K to $380K. With the real estate bubble those prices topped out at just under $1M. Some people sold for that (obviously someone bought them). They are now going, post-crash, for around $600K. No, modular homes are built in factories and put together on site. Manufactured homes can only be a single or double, sometimes a triple wide, but I've never seen one. They also only have one level, though I did see an image of one that was built with 2 levels with an attic like second floor. Manufactured is the modern term for mobile home, they are stronger and can withstand higher winds. Alright, i'll clarify since half this thread is turning into "what is a manufactured home?" All I've seen around the area I'm moving to are manufactured/mobile homes (like double wides) on rented land. The ads for these homes call them "manufactured and/or manufactured/mobile homes" so that's why i call it that. I do notice the lot rent; is there a way to obtain a record of the lot rent over the past decade? While I would much rather buy an actual carpenter built home on land again, it's not in our budget right now. My research is showing that if we can buy a relatively well kept manufactured home on rented land (mortgage + lot rent) we would be able to get a comfortable size living space for less than the cost of renting an apt out here. But again, I have been hearing it's hard to get a mortgage on some of these things... does that apply to all of them? Does it depend on the bank person applying? Are there certain repairs that pop up more in a manufactured home than they would in a normal house? Getting a mortgage on them can be a problem with many banks. The problem is that if you take out a 20 year mortgage, in 10 years, it's worth far less than what you owe on it and banks know this. If you wanted to sell it in 10 years, you'd probably not be able to get anything near what you owe. Personally, I'd rather rent until I could afford to buy a stick built house. As for repairs, most everything is made cheaper. Roof leaks, walls are thinner (not traditional sheetrock), cabinets are the cheapest prefab you can imagine (I've seen sagging cabinets in mobile homes, along with sagging ceilings), fixtures are very cheap, etc. No, you must be thinking about RVs. Mobile homes and manufactured homes are the same thing. You can have it in a rented lot or own the land. I KNOW the difference between them since I have lived in every form of home created but since you know more about the types of homes I have lived in I guess you are correct and I have no clue what I am talking about. I will tell you the same thing I told another poster, since you know so much more about the homes I have personally lived in you must be correct and I have no clue about the type of homes I have lived in. Please tell me what else you know about me that I don't know better, I'm curious. A MODULAR home is manufactured in a factory, but it does NOT have a permanent metal trailer frame on the bottom to allow it to be trucked to the site of installation. Modulars typically have higher construction standards then the below "mobile home". A mobile home/trailer home/park model/single wide/double wide/triple wide homes are also built in a factory but DO have a metal trailer frame that stays permanently with the house, no matter where it is ultimately installed. Either a "trailer park" "manufactured house park" or "regular (personally) owned property". That's it, that's what a bank or mortgage company, or insurance company will use for their definition when they decide to finance or insure you or not.